The first I heard of it was the Monday evening when a friend called to say that his son’s birthday party had been postponed due to the hurricane warning. Hurricane warning? Five minutes later my brother-in-law called about it too. You’ll forgive me for not taking it too seriously. For a start, we’re not in a hurricane zone. There has never before been a cyclone (as Indian Ocean hurricanes are called) in the Arabian Sea. There have been a few tropical storms, but they fail to make headway into the dry and dusty Gulf. Secondly, Oman had cried wolf a month previously when an Indian holy man predicted a storm and a tidal wave which would destroy the Qurm area. He said disaster would strike on a Wednesday, and a hysteria – which made the expatriate population chuckle – rapidly spread, so that children were kept home from school and more than a few workers failed to go to work. Nothing happened, of course. Except that the Indian holy man was imprisoned for starting the panic. But there it was on the Omani TV station. Warnings to stock up on drinking water and then to stay indoors. Anyone within two kilometres of the sea should find a safe place further inland. On Tuesday morning I saw satellite images of Cyclone Gonu on the internet. It was huge, a swirl spreading its arms between the Iranian and Omani coastlines, with a defined eye. It had been upgraded to a category five cyclone. That’s as strong as a cyclone can get. Hurricane Katrina was a category five. A category five makes trees, rocks and cars dance in the heavens. A category five knocks down buildings. I bought a lot of candles and water, and taped up the windows. 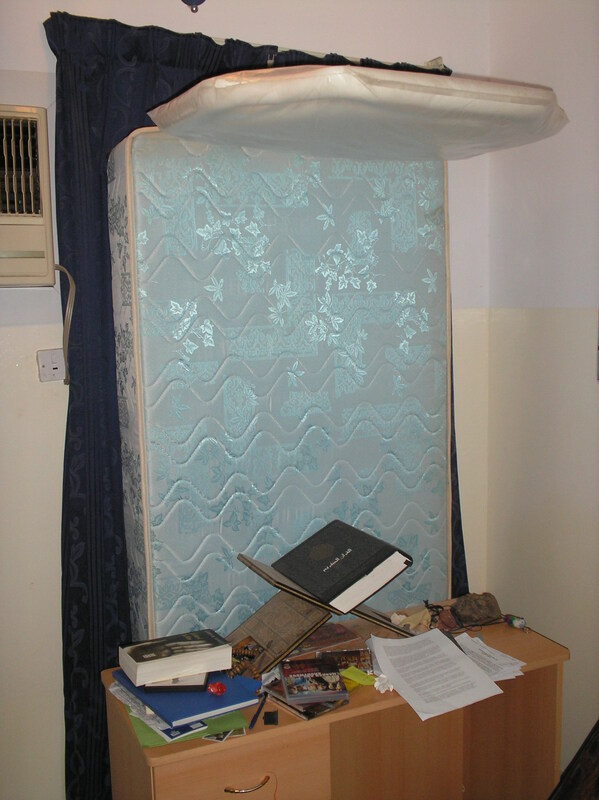 When I’d taped the windows, I shielded them with wardrobes and upended beds. Cloud built up over Tuesday, with spits of rain and gusts of wind. On Tuesday evening the weather forecast said the storm was moving towards southern Iran, away from us, and weakening. Now it didn’t seem such a terrifying prospect it became exciting, a break from the high-forties, sun-blasted routine of an Omani summer. Shortly after midnight I went walking. Remarkably for June I didn’t sweat. Lightning flashed to the south and east, over the sea. A steady rain started. Torrential rain woke me at four. Now the internet said Gonu had changed course again, and was coming directly at Muscat. Sur was being badly battered. When red light dawned we let the children run about outside in the rain, before it got worse and we’d have to keep them in the house. The storm intensified throughout the day. 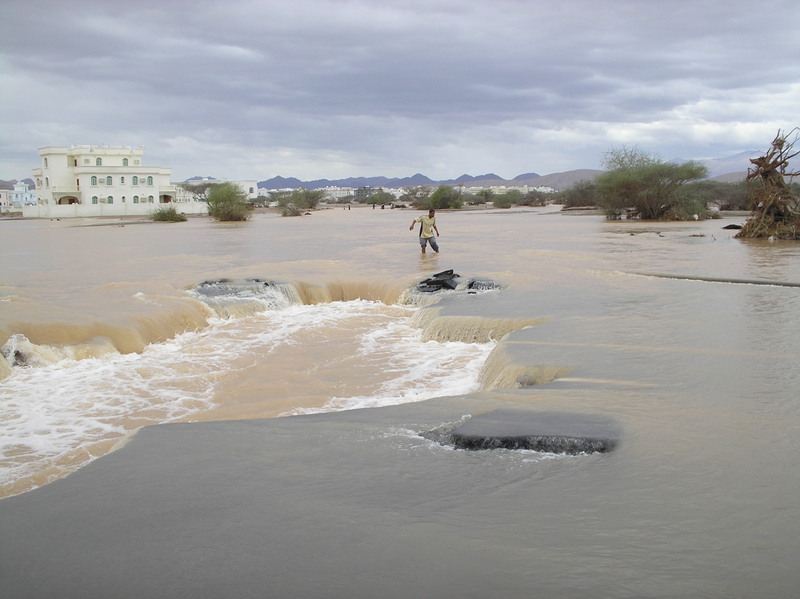 Before noon the wadi must have overbrimmed because the floods came. It always floods when it rains here, the earth being baked and unabsorbent, the city on an edge between rock mountains and the sea, but this time the floods stretched as far as we could see. Water poured through the windows in two rooms, soaking carpets and furniture, making us work with mop and mesaaha. Water started dripping though the ceiling, and here I went up to our Lebanese neighbour whose balcony was flooded. He couldn’t open the door to it so we unscrewed a window frame and got out that way to break the blocked drain pipe with a hammer and bail out with buckets. From up there I saw the building was an island, and many of our neighbours were submerged to the second storey. In the end Gonu was a category one cyclone, and its centre had veered out to sea, sparing us a direct hit. It just brushed us with its fingertips, a whirling dervish of a storm absorbed in the centre around which it turned. I’ve seen worse rain in Britain, or Pakistan. The wind was never more than strong. On Thursday morning we went for a drive to inspect the damage, which was astounding. The roundabout near our house had been partly carried away, partly drowned in mud. Roads were missing chunks. Trees and telephone poles were down. Cars were smashed and turned on their backs. 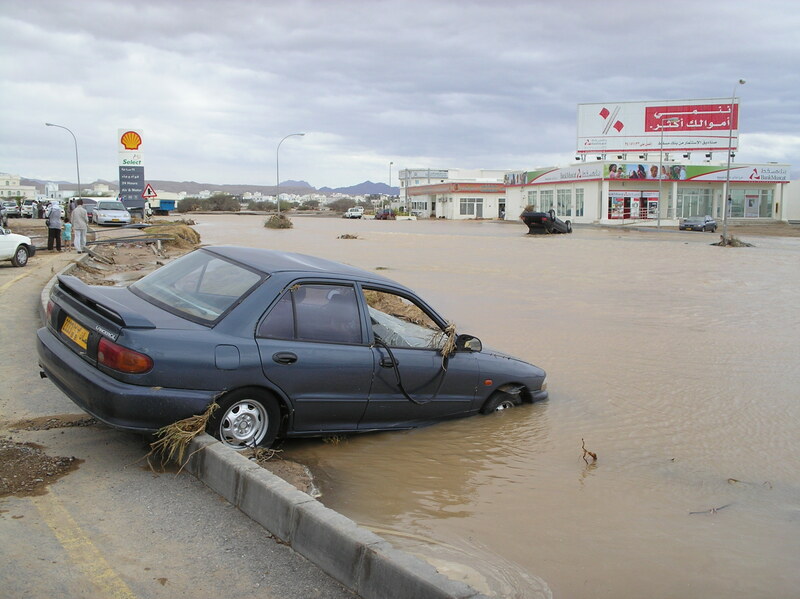 A river rushed down the carriageway towards the coast. The closer to the sea, the more savage the effects, and particularly on the poor. Labourers’ houses had collapsed. Hundreds sat in the streets trying to dry out. Our electricity came back the morning after the storm but at our friends’ house in north al-Hail it remained off. We were sweating without air conditioning so went to sit on the roof, and military helicopters circled loud overhead. It all felt a little like Baghdad. Just one day of it. Without the explosions or the fear of your neighbour. The water was off. 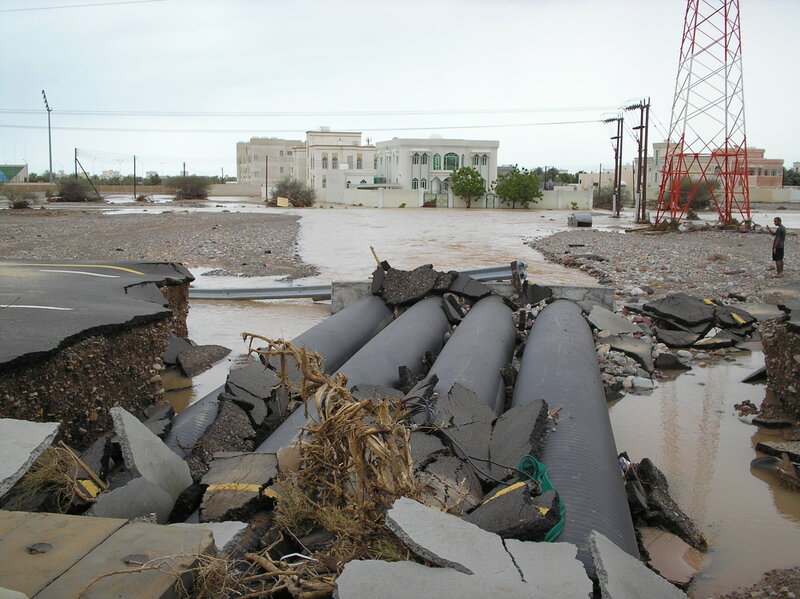 Supply pipes had been broken by the storm, plus sewage had been mixed up with it. The army and others came round to hand out drinking water and water to fill the bath with, for washing and flushing the toilet. On Sunday I drove my brother-in-law, who’d wisely come to stay with us, back to his flat in al-Ghubra. It was much worse than anything we’d seen. Cars piled on top of each other three or four deep, mud and felled trees and wires, rubble and gaping holes in the roads, not in locations we’d have to point out to each other, but everywhere. The death toll for Oman then stood at 50, a modest day’s bodycount for Baghdad. The final toll must be far higher. The crisis reinforced basic characteristics of the country. The poor – the Indians – suffered most. The rich least of all. That’s normal: remember New Orleans after Katrina. What isn’t normal is that there was a genuine sense of brotherhood in extremis. Neighbours looked after each other. Everyone kept calm. Everyone smiled. That’s the abnormality of Oman, this gentle, safe country, one of the last refuges of a traditional community-based Islam. Any lessons? I don’t know much about the climate, but it seems very likely that this first-ever Arabian Sea cyclone, like the droughts in Australia and the United States, like the more severe hurricanes in the Caribbean, was caused by global warming. It seems likely, therefore, that it will happen again. The ramifications for Oman will be dramatic. A good step would be an Omani reacquaintance with the natural environment. Wadis will reclaim their paths. 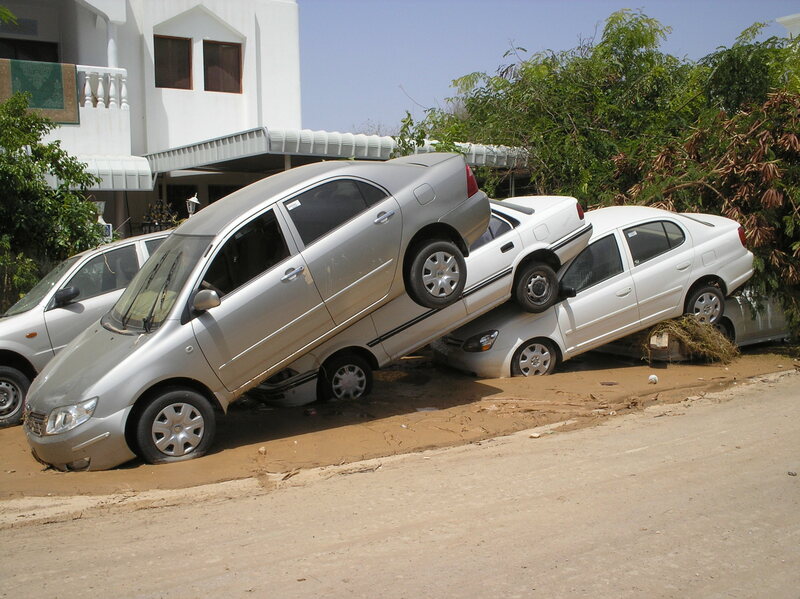 Building roads and houses in the wadis regardless won’t work. And unsustainable beachfront projects like The Wave (see my posting called Unsustainable Development) must be suddenly looking .. unsustainable. Which could be a good thing. 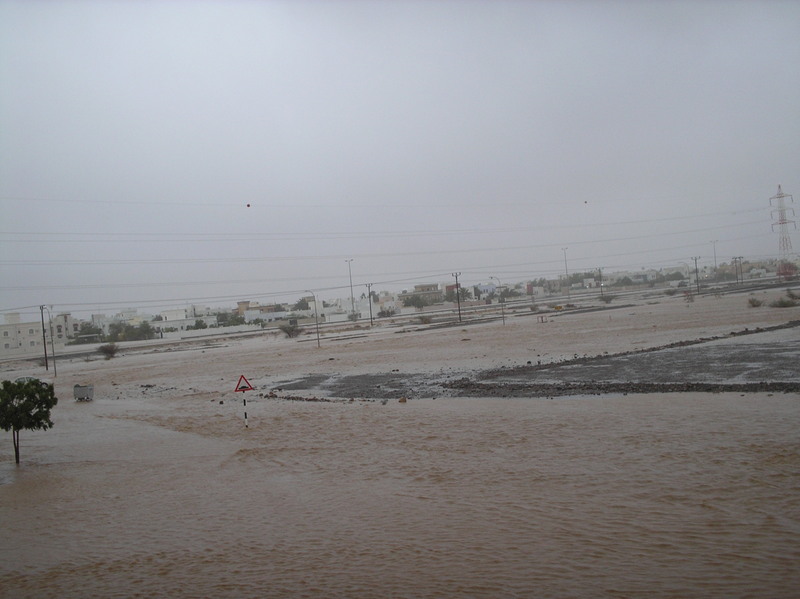 Much of Sur and Quryat are still underwater, a week on. The water by now, especially in these temperatures, is filthy. And Qurm, I almost forgot. There was a mini tidal wave, and the business district was trashed. On a Wednesday, as predicted. Has the Indian holy man been released from prison? He just got his timing a bit skewed, after all. What a very interesting post, and extremely well-written (as always). That’s fascinating re the ‘prediction’ of the event and that such is normally unheard of. I agree with the conclusions you draw and it was good to read of the community spirit. I hope all is getting back to normal as soon as possible and that studies/contingencies are being made. I echo what maya said, beautifully written and full of vivid images and twists and turns. You have a great talent Qunfuz. I enjoyed reading this post immensely, especially that I know Muscat reasonably well and love its architecture.